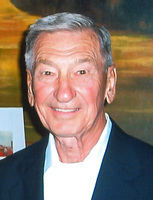 Provide comfort for the family of Fred Tylec with a meaningful gesture of sympathy. Frederick W. Tylec, 94, of DeWitt, passed away Friday evening, January 4, 2019. Born on January 19, 1924, in Meriden, CT, he was the son of Louis and Mary Tylec. He served in the United States Army as a medic during WWII. Retiring as the Director of Microbiology from Bristol Myers Squibb. Fred loved everything about the outdoors, boating, snowmobiling, fishing, hunting and being at the St. Lawrence River. He is predeceased by his wife Judy Tylec and son David Tylec. Surviving is his daughter, Carol (Mark) Eich and Peggy (Gene) Lockhart; grandchildren; and sister, Frances Cichowski. Contributions may be made in his memory to the The Multiple Sclerosis Resources of CNY, P.O. Box 237, East Syracuse, NY 13057. Carol, Peggy ... so sorry for your loss. I remember your dad as a happy friendly guy with a great sense of humor. There was one day Dave your dad & I went hunting on the ridge. It was a typical cold peaceful winter day. We settled in to await the deer to come by. Next thing I remember is your dad whispering “gimme your gun if you’re gonna sleep out here”. I was better with the camera. He will live on in our hearts.